There are 18 wildfires now blazing across California, which means many of the state's residents are waking up to the smell of smoke and hazy skies. 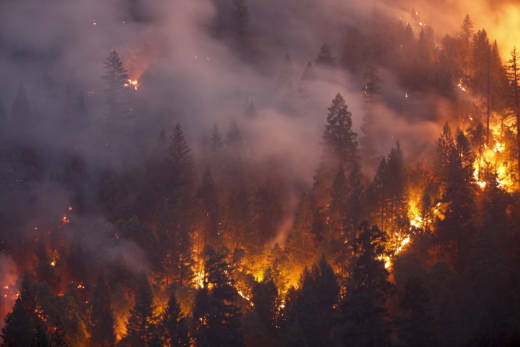 The Carr fire near Redding has scorched at least 141,000 acres, and killed seven people. Three fires in Mendocino County are all less than an hour away from Santa Rosa — where some neighborhoods burned to the ground last year. Confronting constant reminders of what fire can do has become a terrifying reality for people who survived last year's flames and are still piecing their lives back together. Psychologists, therapists and other counselors are working to assure these survivors that surges of panic, grief and agitation are healthy and normal, even as they offer tips for quenching the terror. The view from Danielle Bryant's bedroom window, in her new temporary apartment in Santa Rosa, is pretty unsettling these days. "The orange-tinged sky is just enough for me, to set off my anxiety and feelings of fear," Bryant says. Last year on Oct. 8, an explosion jolted Bryant awake in the middle of the night. Howling winds shook her Santa Rosa house. The air was hot. Bryant and her husband jumped in their car and fled with only the clothes on their backs. "I feared for our life," she says. "We were running for our life." When they returned the next day the street was desolate. The air wreaked of burnt chemicals. Homes were charred rubble. The October flames eventually destroyed thousands of houses and killed 44 people. “We were victims to one of the most terrible events in history,” says Bryant. For the past year, Bryant has struggled with many symptoms of trauma: sleeplessness, nightmares, irritability, and loss of appetite. Aftermath of last years fire in Santa Rosa. Courtesy of Danielle Bryant. "Agitation — so quick to agitation," says Bryant. "Hence the fight that I got in the other night with my husband." It was a fight about nothing. She says she blew up after watching the news about all the fires on television. She hasn't turned on the TV since. She's hearing similar stories from friends and neighbors. "You can just feel it," says Bryant. "There's a sense of tension here in Santa Rosa." Bryant's current apartment is about a mile away from her old house. She's still working through everything that happened. "These last 10 months," she says, "have been one of the hardest times of my life, because what you have to do after an event like this is, you have to go on living." The emotions and physiological responses Bryant describes are common after a life-threatening event. Francis Fuchs is a psychologist and counselor in Santa Rosa who has been treating fire victims who are highly affected by all the current blazes in northern California. "They are having more difficulty with sleeping," Fuchs says. "They are having a heightened sense of anxiety and unease. They are having some flashbacks of their fire experience from last October. Also mood changes --- more anxious or tearful." Many laypeople casually use the term PTSD – post traumatic stress disorder — to loosely describe a response to a terrifying experience. But psychologists say not all responses to trauma actually fit that diagnosis, which includes symptoms that must last more than a month and be severe enough to interfere with relationships or work. Rather, the fear, anxiety, sleeplessness or shallow breathing many fire survivors are experiencing right now are healthy and transient, psychologists and therapists say — the body's evolutionary responses to the belief that danger is again near. "It's preverbal, it's precognitive," says Padma Gordon, a spiritual counselor and mindfulness educator in San Rafael. "So what happens when we're threatened: We grip; we contract; we stop breathing. And all this is registering in our brains and in our bodies, instantaneously. Because we're hardwired for survival." Danielle Bryant's Toyota Corolla that was destroyed on Oct. 8, 2017. Courtesy of Danielle Bryant. When a survivor of trauma again senses signs of the previous threat – the smell of smoke, the color of the orange sky, the sound of a phone "ding" for an emergency alert — the protective survival system kicks in, even when the danger isn't immediate this time. “The brain is designed to alert you to threats,” says Jennifer Freeman, a licensed marriage and family therapist in Berkeley. “The trouble is, the brain keeps rising to the occasion, even when the threat isn’t current.” Freeman has worked with survivors of trauma and in the aftermath of natural disasters — including earthquakes and tsunamis — for three decades, both in the U.S. and internationally. There are a variety of cognitive and physical techniques that can help us through periods of trauma, counselors say, and people vary in which ones they find most helpful, often depending on their own cultural traditions. Freeman says one of the first steps to calm the mind and body is to be kind to yourself and respect that your system is trying to help you survive. "We can say, 'Thank you body, thank you brain for trying to take care of me,'" Freeman says. "Which is very different than, 'Oh, what’s wrong with me?' and 'I need to get rid of it.'" Gordon recommends reminding yourself out loud that the fearful event is not happening again. It may sound silly to talk to yourself, but the body, she says, recognizes and calms with the sound of your voice. Even setting yourself a task — counting all the green objects you can see from where you sitting, for example — shows your brain there is no threat nearby, says Wowlvenn Seward-Katzmiller, a somatic psychotherapist in Sebastopol. Other tools for 'coming back to the present' can be as simple as tapping your feet, Gordon says. Or smelling something you enjoy — such as tangerine or balsam fir or cinnamon — or playing calming music. To consciously slow rapid breathing, try putting one hand on your belly and one hand on your heart. Slowing your breath activates the parasympathetic nervous system, Freeman points out, which is the body’s calming system. Seward-Katzmiller suggests doing long, slow exhales as if you are blowing out a candle through a long straw. And here's a fun one: have a long (20 seconds) belly-to-belly hug with a pet or loved one. People also can heal via their community — by helping others. Asking questions that elicit the story of how someone survived the traumatic event is an approach Freeman worked with in Samoa, after the 2009 tsunami. And if you're helping someone, it's important to ask what kinds of help they want — not to assume that each approach works with everyone, she adds. When Freeman was working in Samoa, for example, she learned from local therapists and others there that many people preferred to work via community and family groups, rather than in individual therapy. Plus, basic situations such as an inability to pay for a temporary home or the threat of deportation can change what a person most needs in order to heal. During especially hard times recently, Danielle Bryant has found herself driving to the empty lot in Santa Rosa where she used to live. "It was like visiting like a gravesite," says Bryant. "So it was a place to just come and be and to cry." After spending a few moments gazing at the ruins, she backs out of her parking spot, pauses, then takes a deep breath. "Just seeing the smoke off to the east," says Bryant, looking at the sky, "I get this sense of dread." As we drive down her old street in the Coffey Park neighborhood we pass the skeleton of a burnt-out car, still parked in a pile of ash. Bryant pulls up to an empty lot overgrown with weeds, and gets out of the car. We carefully tread through some weeds and knee high bushes. "See this outline, this box? That was it. That was our home." Bryant crouches down and puts her head in her hands. Triggered memories can still feel overwhelming, but her neighborhood is also coming back to life. Next door, a crane drops a pile of plywood beams, and construction crews are framing new homes. All over the ground, green sprouts are pushing through the blackened decay. "This green is hopeful to me," says Bryant. "This is just a sign that nature comes back — and is forgiving. And that we can, we can. We can come back." To help process her grief Bryant is taking a writing class. She's finding it therapeutic to put her painful memories into words and phrases. "Grief breathing into my bones of lead," reads Bryant. "It stuck there in the deep. Was it all a dream? After we were refugees." Even as wildfires rage within an hour of Santa Rosa, Bryant is excited at the prospect of rebuilding the house in the old neighborhood, and moving back -- she hopes within about year. "It is going back to the place of trauma," Bryant admits. "But it's also going back to our home." Editor's Note: Marisol Medina-Cadena contributed to this report.